CRS Info Solutions offering professional Software Training program by real-time working consultants. Are you looking to master Informatica skills then we are perfect institute for you to teach. Please fill our contact form we will connect to you and provide you best trainer for informatica online training. Informatica ETL tool is market leader in data integration and data quality services. Informatica is successful ETL and EAI tool with significant industry coverage. ETL refers to extract, transform, load. Data integration tools are different from other software platforms and languages. They have no inbuilt feature to build user interface where end user can see the transformed data. Informatica etl tool “power center” has capability to manage, integrate and migrate enterprise data. So Informatica Online Training will be helpful to you to excel in that field. So Informatica Online Training will be helpful to you to excel in that field. fill the contact form. We will get back to you within no time. CRS Info Solutions’s Informatica Training will train you on how to administer the tool efficiently, and to upgrade your skills to the latest version. This Informatica Certification course provides you the overview of Informatica PowerCenter Product and its installation, the concepts of data integration and data warehousing. In CRS Info Solutions Informatica course, you will learn how different development units of PowerCenter can be used to create a simple mapping. The Informatica Certification Course introduces you to advanced transformation techniques, and ETL scenarios using Informatica 10. You will understand the features provided by Informatica to debug, troubleshoot and handle errors. You will learn the best practices for optimum performance of your ETL process & to manage the repository effectively. An overview of the PowerCenter administration console is given, and you will recognize and be able to explain integration and repository service properties. The Informatica Training Course will also deal with command line aspect of Informatica PowerCenter 10.
Who should go for this Informatica Training Course? 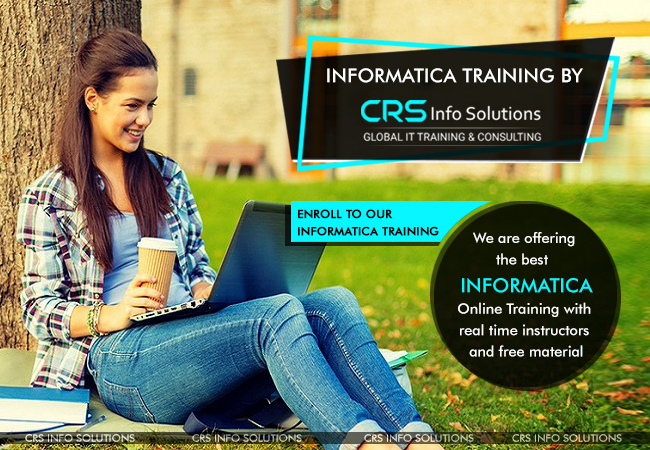 What are the pre-requisites for CRS Info Solutions’s Informatica Training Course? e) Tasks And Types of Tasks. 7. TYPES Of LookUp Caches. Our trainers are passionate and focused in quality and accuracy for delivering the best services for our clients. Our pega online trainers are from top MNCs and carry years of experience.